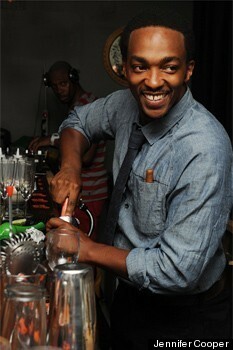 Most people know Anthony Mackie from his roles in The Adjustment Bureau or The Hurt Locker and Brooklynites are now getting to know him as the man behind new Bed-Stuy bar NoBar. But this isn't just any celebrity-turned-nightlife-impresario. 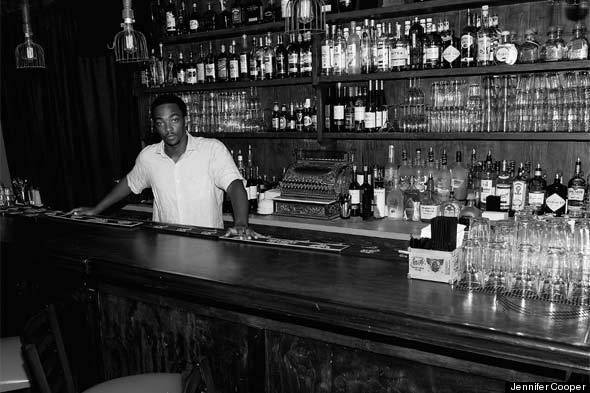 Not only will you find Anthony behind the bar most nights, you'll find that he built the bar. And the bar back. And oh yes, the floors. And did we mention this man is not afraid to snake a toilet? Read on to see how he stayed on budget thanks to eBay, why (he says) women aren't impressed with his handy skills and his feelings on mass-market furniture in our exclusive Q&A. The bar that Anthony Mackie built. ShelterPop: Let's start from the beginning. How did you get started in carpentry? Anthony Mackie: My dad was a carpenter and a roofer, and every summer he would make his sons work with him -- I did it for three years. I have a lots of carpenters and contractors in my family so that's how I got the bug. There's just something remarkable about taking a piece of wood and making it into something. It's gratifying, really fulfilling. Anybody can buy a $2,500 designer table but not everybody can make one. When I was in college I couldn't really afford furniture so my internship boss -- the head of the foremen at Julliard -- let me use all his saws and tools so I could make my own furniture. Do you still have any of it? You know what, I don't. This is not a testament to my work but it all fell apart. But that was a long time ago. It did last more than ten years. Fair enough. Now, at NoBar, you've built everything but the chairs. Can you elaborate? 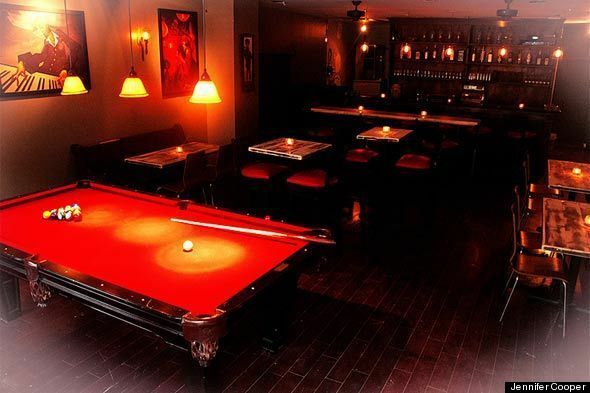 I built the bar, the bar back, the footrest, all of the tables and I made some of the frames for the artwork. I also re-framed the entire place and taped and floated all the sheetrock. In a few places, the wood on the floor was kind of destroyed, so I got 1x4's and tongue-and-grooved them. I made the flooring. It's amazing, you can save a fortune by doing it this way. Everywhere I was looking, they wanted $475/square foot for the wood flooring I wanted. And when you're working on a 900-1,000 square-foot place, it can add up. So I went on eBay and found these irregular wood logs and I bought huge lot of wood, all different sizes, but the same length. I got a router table and created nice, small tongue and grooves on them. I love that you got your flooring on eBay. Also, I didn't want traditional banquettes -- they take up too much space -- so I went on Craigslist and found this guy who was selling these church pews for 70 bucks. All you had to do was pick them up. So you picked them up. Did he recognize you? No, it was pretty funny. I put on my sunglasses and my hat on low. He was like "Eh, give me my $70." I got out of there as fast as possible. Take a look at those floors! It all sounds like so much fun. What kind of challenges came up? I had an original location set, so I built all this stuff for a different space. But my relationship with my business partner went sour fast so when we found the new place I had to recut and refit the bar and tables. Yeah, and the plumbing here in New York is just a disaster. I've done projects in a bunch of different places but the plumbing here is absolutely amazing. I was elbow deep in the toilet last night. It rains and everything gets backed up. I have a 100-feet snake so I snaked all the way out to the street. Why were you doing this? Where's your staff? My dad was very successful because he worked harder than everyone that worked for him. If all the people who work here as employees see me, the movie actor, working hard, they have nothing to complain about. Besides, I consider myself to be a man's man. I'm not afraid to get my hands dirty just because I'm in a movie now and then. I like your attitude. Any other mishaps? Oh yeah. Right before we were about to open the first time -- liquor license was here, the health department came, we were all set to open the doors -- we turned on the ceiling fans and the entire ceiling drops. All the center braces rip out of the roof. It bowed down like a foot and half. So we went and made a T out of a 4x4 and a 2x6, put a jack under it and jacked up the whole ceiling. Put holes in the sheetrock and rebraced it. The day the guy did it originally I wasn't here and he did it completely wrong. It set us back a week and a half. But now that you did it, it's all safe, right? I was literally monkey bar swinging from beam to beam to make sure they wouldn't fall again. This is going nowhere. Be honest. Do you ever use the fact that you built this all by hand as a pick-up line? Not at all. One thing I've realized is that women of this generation are impossible to impress. I tell them I built everything, they're like "who cares". I haven't found my impressive pickup line yet. But I'm going to just throw some stuff out while bartending. How much time are you planning to spend there? As much time as I can. I'm not working on any movies until September so I'm here, tending bar and cleaning toilets. You're such a Renaissance man. Do you do any other DIY projects? Maybe some crafting? When I redid my house in New Orleans, I tried to make curtains. Or as they call them, drapes. It didn't work out. They're really expensive. For 14-foot ceilings, you're paying $500-600. So I went and got material and tried to make some drapes. I borrowed a friend's sewing machine because it looked so easy. But the material gathered and ripped, I burned the machine. Ha! Ok, so fine. When you finally find the right pick-up line, you'll have to find a woman who can sew, to complement your skills. Exactly. I love the building part. The sewing? Not really for me. Do you judge people with mass market furnishings? Not at all. Though I did just get rid of my last piece of IKEA furniture. The last little table. I found this wood in upstate New York and made a nice A-frame picnic table to replace it. Building it, that was my therapy. 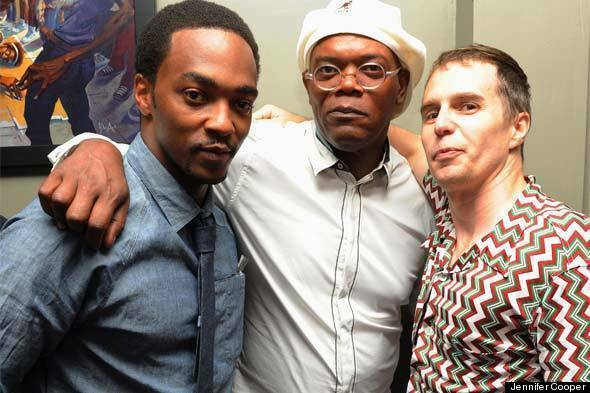 Anthony with famous friends Samuel L. Jackson and Sam Rockwell. You've said if acting doesn't work out you'll have a future in construction. Any similarities between the two fields? It's funny, I always wanted to do a carpentry TV show but every time I've pitched it, it's been shot down. The interesting thing about acting is that you're always developing and creating something. Just like construction. And when people see you do good work, they refer you to the next person. If you do shoddy work in construction -- or are an a**hole on a movie set -- your career is cut short. Lucky for Anthony, it seems like he's got both areas down pat. And luckily for fans of his movies -- and his bar -- he's doing a stellar job doing both at the same time. As for that carpentry TV show ... hey HGTV, are you reading this? Get this man a show. We promise we'll watch.